Following the two other round-up posts I have done this week a December in review post seems a little redundant, but it helps to complete the picture of the year. I read nine and a bit books in December – the bit will now have to be my first book of 2019 – finished my A Century of Books and scored a wonderful pile of new books at Christmas. I began the month reading A Saturday life by Radclyffe Hall, a comic novel about a precocious child, artistic experience and the possibility of reincarnation. Olivia by Dorothy Strachey (published under the pseudonym of Olivia) was a little surprise, I hadn’t expected to enjoy it so much. Olivia is sixteen when she is sent to Les Avons a finishing school near Paris, run by two mademoiselles. This is a school of an entirely different kind. It is a school where there are few rules, where laughter and passionate discussion are actively encouraged. Olivia revels in this atmosphere so unlike anything she has experienced before. The Towers of Trebizond by Rose Macaulay is a novel with a famous opening line – but it is worth reading for more than that. The novel follows the progress of a group of characters as they embark upon a journey from Istanbul to Trebizond. They are, Laurie – our narrator, her Aunt Dot (Dorothea Ffoulkes Corbett) and Dorothea’s friend, high Anglican priest Father Hugh Chantry-Pigg. 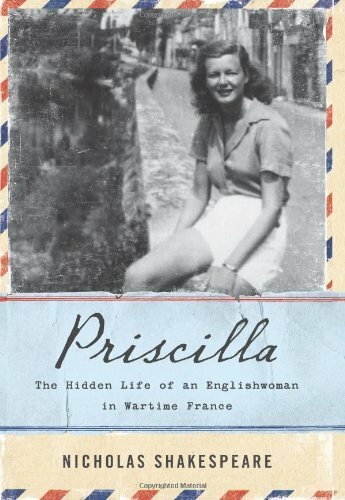 I’ve loved everything I have read by Diana Athill and Stet – an editor’s life was no exception. Shining a light on fifty years of publishing, her work alongside André Deutsch, and the writers she worked with, I can see why Stet is a favourite with many Athill fans. For my 1993 slot of A Century of Books I read A Virago Keepsake, a collection of essays published in 1993 to celebrate Virago’s twentieth anniversary. Twenty pieces by or about Virago writers – many of them reminiscences of the beginnings of Virago, and the start of careers. There were very familiar voices with pieces by Margaret Atwood and Maya Angelou, other writers were new to me. A collection very much of its time. The Old Man and Me by Elaine Dundy was one of my highlights of the month. In Honey Flood we have a fascinating unreliable narrator. In a city of bohemians, drug users, hipsters, jazz clubs and smoky bars, Honey sets about meeting C.D McKee, a legendary Englishman of enormous proportions and wealth. She is a young woman on a mission, and she needs to reinvent herself to put her plan into action. Basil Street Blues by Michael Holroyd was recommended to me by someone on Twitter – a family memoir in which Holroyd writes honestly about his family, taking something of a back seat himself. Playing the Harlot by Patricia Avis was my final book for ACOB, first published in 1996 having been initially refused publication when it was first written. 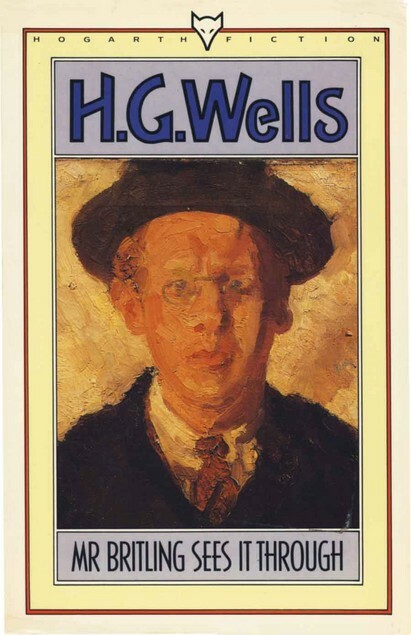 Set among the raffish literary crowd in which Avis moved – which included Philip Larkin, we follow Mary and her friends and lovers through several years of complicated relationships. Appointment in Arezzo – a friendship with Muriel Spark by Alan Taylor is a wonderful book, having read Spark’s autobiography Curriculum Vitae last month, this book provides another layer of understanding about Muriel Spark. So, yes rather untidily I do still have two books from 2018 to review – I will get back to reviews soon. In 2019 I will be reading more of whatever I please – fewer challenges this year. Though I am looking forward to the Librarything virago group’s year long reading event. Reading the 1940s – which is something which will be very easy to dip in and out of. There is a theme for each month – January has the theme of family. There aren’t really any rules – most of us will probably read mainly Virago and Persephone editions/authors though I can see Dean Street Press editions and perhaps Vintage editions creeping in too. I already have lots of books that will fit so I will probably join in quite a lot. Pretty much anything goes – published in the 40s or set in the 40s – fiction or non-fiction, set anywhere in the world, we’re certainly not restricting it to the war years. In a couple of weeks, I will be re-reading Some Tame Gazelle by Barbara Pym with a Barbara Pym FB group I started a few years ago. My book group will be reading Milkman by Anna Burns, so that will probably be my next read. I am currently reading Mrs Tim of the Regiment by D E Stevenson on my kindle – and enjoying its relaxed and witty tone. December is such a busy time, with Christmas to prepare for and evenings out to enjoy – culminating however in some time off work for Christmas. Still I managed some good reading time in the midst of all of that. Librarything finished the year reading the work of Sylvia Townsend Warner, with which I happily joined in and of course I always like to find some Christmas themed books to read. I started the month reading Love’s Shadow by Ada Leverson, who in my review I said I hadn’t read before – later I discovered I had read The Limit – and hadn’t loved it. It is hard to keep track! My very small book group had chosen to read- Lolly Willowes by Sylvia Townsend Warner giving me the perfect excuse to re-read it. It is just as good the second time. Another Little Christmas Mystery by Lorna Nicholl Morgan, was a very enjoyable little winter mystery but it’s not really set at Christmas. 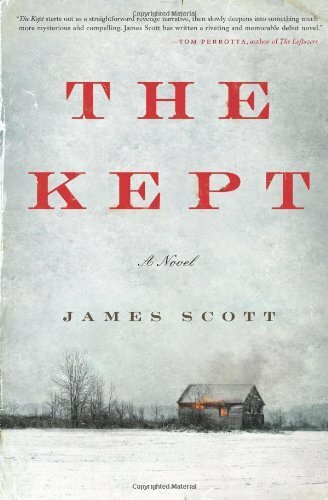 The novel has been retitled to appeal to readers like me, it’s worth reading. Plenty of snow but not a sprig of mistletoe or strand of tinsel in sight. The selected stories of Sylvia Townsend Warner is a fantastic collection – spanning forty years of her writing life, it shows perfectly, what a consummate short story writer she was. Alive, Alive Oh! By Diana Athill is another of her wonderful collections of memoirs, I love her spirit and attitude to life and ageing. I happened to read this just a few days before the author’s 100th birthday. A Christmas Memory by Truman Capote was a slim little book I bought last Christmas and didn’t get around to. It contains three little stories for the festive season. Portrait of a Murderer by Anne Meredith was recently re-issued by the British Library Crime Classics as their fiftieth title. It is a clever, intelligent mystery, which was marred a little by the anti-Semitic treatment of one character. Winter by Ali Smith – also set at Christmas – was the perfect read for the Christmas weekend, I flew through it, finishing it on Christmas Eve. It made my twelve books of the year list at the last moment. Long Live Great Bardfield the autobiography of Tirzah Garwood is a brilliant account of the lives of artists Tirzah and her husband Eric Ravilious along with the many people they knew. It is one of three books I still have to review. The Lime Tree by César Aira was my first book to arrive from the Asymptote book group, a novella from a prolific Argentinian writer whom I have to confess to not having heard of. Chedsy Place by Richmal Crompton really was my last book of the month and the year – I finished it late on New Year’s Eve – it’s always nice to finish the year tidily. So, in looking ahead to January, I must begin by looking ahead to my reading challenges this year. I want to try and read a bit more fiction in translation, but that will be only one book a month at the very most. Of course, #ReadingMuriel2018 starts today – and I am very excited about that – so many people joining in or planning to join in. I began in earnest, started to read The Comforters in bed this morning. For those who want to keep track of the schedule or share thoughts, links etc I have created a dedicated page for the read-along which you can find here. If all that wasn’t enough – I have also decided to do A Century of Books. Simon from Stuckinabook and Clare from the Captive Reader are doing it too as I think are several others. This is my first time of ACOB – and I have chosen 1919-2018 as my century. I’m not working to any prescribed list – the idea is I fill in each year as I read a book first published in that year. I understand it gets harder as years get checked off. If you want to follow my progress – and I have said it will probably take me two years – I have created another page here, where you can. Not very much to see yet. I am hoping I can do the majority of the reading from my existing tbr – and I am not going to use any re-reads. It’s already the 1st January and a brand-new year and here I am still rounding up last month. There are always so many blog posts to squeeze into the end of December. Particularly of course my books of the year post. I still have two December reads to review. December was a pretty good reading month for me, I finished my #Woolfalong reading with The Waves, and read a couple of Christmassy themed books as I like to toward Christmas. December started very well indeed with me reading A Game of Hide and Seek by Elizabeth Taylor – a re-read of what is probably Elizabeth Taylor’s best novel for my very small book group. It felt like such a long time since I had read a Mary Hocking novel – and so I picked The Mind has Mountains from the self after a discussion about with a fellow Hocking reader on my Mary Hocking Facebook group. It’s a complex, ambitious novel – as I find many of her lesser known works are – a novel I kept thinking about after I finished.I will be reading more Hocking soon, that MH FB group are having a little group read at the end of January. The Gingerbread Wife was a superb little collection of stories by Sarah Vincent author of The Testament of Vida Tremayne. An English Murder – was the first of those Christmas themed reads, and it suited my mood perfectly at a busy tiring time, a lovely old fashioned country house mystery, which is also wonderfully clever. The Waves was my final Virginia Woolf read of the year – although I shall be reading some books I have left, during 2017 too I should think. The Waves is challenging, but I found it much more enjoyable than I had expected and rather poignant. The writing is absolutely exquisite. The True Heart by Sylvia Townsend Warner was a delight, a book I loved every bit as much as Lolly Willowes. 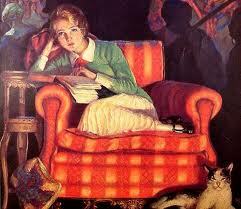 Actually I have loved everything I have read by Sylvia Townsend Warner, she is fast becoming a favourite. The True Heart is deeply charming and wholly uplifting. The physically delightful Christmas Days by Jeanette Winterson was my second Christmassy read – and a more Christmassy book it is hard to imagine. I loved every bit of it, even the recipes (and I don’t cook much). Persephone book 117 The Godwits Fly is an excellent novel in many ways though I felt slightly underwhelmed by it, I may have just expected too much of it. The writing is beautiful, and the story though rather sad, mirrors the life of the author whose own life was far sadder I feel. My Name is Lucy Barton is a novel I kept hearing about since early in the year, it was my first by the author Elizabeth Strout but it certainly won’t be my last. The Wind Changes by Olivia Manning was a book I received at Christmas as part of my Libraything Virago secret Santa gift – I was away at my Mum’s for a couple of days and needed to start a new book on boxing day. It was Olivia Manning’s first novel – and I liked it a lot. Review to come. Mothering Sunday was the latest novel from Graham Swift, published earlier this year – only the third I have read by him. I bought it at the festival bookshop while in Hay on Wye last May. I’m not surprised to have seen it on one or two best of lists – it really is an excellent novel. As the year ends I am disappointed that my reading continues a downward trajectory, I don’t really think mere numbers are important. However, with more and more books waiting to be read, I do want to stop that pattern somehow. I read 116 books in 2016 which is three down on 2015 down from for instance 141 in 2008 – I have only been keeping a record for the last ten years. 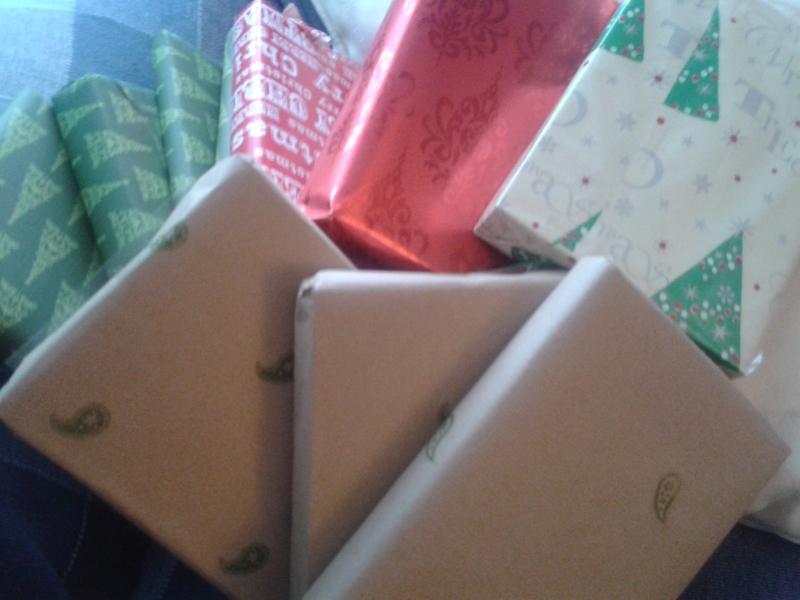 Christmas was slightly bookish – well when isn’t it, and here is what I got. Smoke by Ivan Turgenev, A Lady and her Husband by Amber Reeves, A Solitary Summer by Elizabeth von Arnim, Alive Alive Oh, Diana Athill, Madame Solario by Gladys Huntington, Rhapsody by Dorothy Edwards (amazed I have never read it). The Night before Christmas – Nikolai Gogol, The Selected Letters of Willa Cather, The Wind Changes – Olivia Manning (just read), A population of One by Constance Beresford-Howe, Pélagie by Antonine Maillet, The Imperialist by Sara Jeanette Duncan. Those final three all from the New Canadian library -they look fascinating (I just wish the print was bigger – need to get some extra bright light bulbs). Those three New Canadian library editions, the Willa Cather letters, the Olivia Manning and The Night before Christmas were all from my Virago secret Santa – how spoiled was I? So here we are in January and I am revelling in not really having any serious reading plans. I have had one reading challenge or another every year for the last six years or so – so I definitely need a year when I can be more spontaneous. I want to get back to reading exactly what I want to read, and discovering what’s at the back of my overladen tbr bookcase. What did December bring you? Something fabulous I hope. As December begins to draw to a close – I have been rushing to get everything I read in December reviewed before the end of the year – and I’m not going to manage it. I published my top books of 2015 post a few days earlier than usual to try and fit everything in, but it hasn’t made any difference. I’m pretty sure of just about finishing my final read of 2015 before midnight tonight (it might be close) but I certainly won’t get it reviewed as well. At the time of writing (or at least starting this post) – there is the book read before that still to be written about too. I suppose I liked the idea of having everything neat and tidy before the New Year, but never mind. I hope you all had a lovely Christmas – I had a nice, quiet family Christmas – with some reading time and some great telly. I did receive a few books for Christmas, and two lots of book tokens – always very welcome. I am particularly excited at the prospect of Parson Austen’s Daughter by Helen Ashton and Britannia Mews by Margery Sharp. Mrs Dalloway will be read in the upcoming #Woolfalong. I provided my family with some instructions as to what to look for on Abebooks – and they did me proud. Troy Chimneys was sent to me by Kaggsy – and Telling the Bees was my Birmingham bookcrossing secret Santa gift. A friend bought me We have Always Lived in the Castle – which I have wanted to read for ages. Actually December has turned out to be a pretty good reading month for me. I indulged in a little Christmassy themed reading, read a couple of review copies, and a book group read made it on to my top 12 books list. December began with me reading that book group choice – Nora Webster – such a wonderful novel. A novel depicting grief and the re-building of a life following bereavement has made me want to read more by Colm Toíbín. The Old Man’s Birthday by Richmal Crompton, from Bello books was a joy of a different sort – 1930’s comfort reading, with fabulously drawn characters. From Netgalley I read, Trouble on the Thames by Victor Bridges is one of the British Library thrillers, it was an enjoyable read – though possibly not quite as tense and atmospheric as I had expected. Over the River, again read on my kindle – was the ninth and final of my Forsyte Saga Chronicles, it was a thoroughly enjoyable conclusion to what has been a brilliant series. I will miss all those Forsyte Saga characters. A Snow Garden and other Stories by Rachel Joyce was the first of this month’s Christmassy reads, a lovely little collection from the acclaimed author of The Unlikely Pilgrimage of Harold Fry. The Visiting Moon by Celia Furse was not a book I had been planning on reading until I saw it reviewed on Leaves and Pages blog and quickly went in search of a copy. It is the lovely story of a nineteenth child’s Christmas visit to her aristocratic grandparents’ country estate. I then found time to finally finish a large collection of Shirley Jackson writings; Let Me Tell You that I have been dipping in and out of since September. A fantastic collection of essays and short stories it would make for a really good introduction to Jackson’s work. Having only read a small amount of Shirley Jackson I am now eagerly anticipating reading more. Another Christmassy collection of stories from Anthony Trollope, Christmas at Thompson Hall & other Christmas stories was next, one of the Penguin Christmas Classics which have been calling to me from afar. Having read enough Christmas books I pulled down a lovely green Virago; The Curate’s Wife by E H Young a fantastic sequel to the earlier novel Jenny Wren. My final book of 2015 was a review copy from Renaissance Books, My Shanghai 1942-1946, a novel – though one based upon the life of the author’s mother’s experiences as a Japanese woman living in occupied China. January of course sees not only a new year – but the start of #Woolfalong – I have already invested in a few Virginia Woolf books and I’m all ready to get going. To the Lighthouse will be my first read of 2016. I’m not yet making any other definite plans for January – but that Helen Ashton book I received for Christmas is calling loudly to me from the bookcase. I hope you all have a very happy and healthy New Year – and plenty of great reading ahead of you. There have been several reading challenges doing the rounds on blogosphere and social media during November – which I always find difficult to keep up with. The one I did best at was #novellaNovember hosted by Poppypeacockpens – I was reminded how much I love novellas and read a couple of really good examples myself. Unfortunately I failed again to read anything for German Lit month – and I had actually managed to put one book aside for it, just not enough time, maybe next year. Earlier in the month I was alerted to #Nonfictionnovemeber on Twitter – I’m afraid I have no idea who that was hosted by – and so it seems I accidently managed to read one book for that too. So November began for me with a lovely Persephone book – Vain Shadow by Jane Hervey – it tells the story of a family following the death of the family patriarch over a period of four days. The only novel the author ever published, it is a story of great insight and got my reading month off to a really good start. Murder at the Manor is a collection of golden age type stories edited by Martin Edwards, my copy courtesy of Netgalley, and the first of two books from the British Library this month. Bad Feminist, a collection of essays from American writer and academic Roxane Gay, my only non-fiction work in November was chosen by one of my book groups. I was surprised at how readable it was, referencing modern popular culture, it is highly recommended if you want something other than the more academic earnest offerings. Lolly Willowes had been on my radar for a long time, having already read three other Sylvia Townsend Warner novels. With this novel I was particularly captivated by the character of Lolly Willowes. Another review copy came next; My Mother is a River by Donatella Di Pietrantonio from independent publisher Calisi Press, a novella that explores that complex mother daughter relationship with tender honesty. On my trusty kindle I read Flowering Wilderness by John Galsworthy, the eighth book of the Forsyte Saga Chronicles that I have been reading this year – Galsworthy is always such a good storyteller I found it compelling reading. As Strangers Here, by Janet McNeill was kindly sent to me by Turnpike books – who have now re-issued three of her novels. 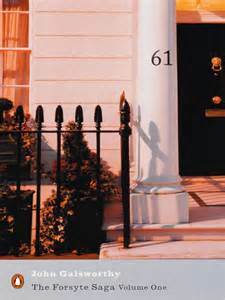 As strangers Here is set in 1950’s Belfast in the years before the troubles with the underlying tensions of that society replicated in clergyman Edward Ballater’s family. They Came Like Swallows, another gorgeous novella was my first ever book by William Maxwell, a writer who I know has a lot of fans. I certainly now intend to read more by him soon. The Santa Klaus Murder, another Netgalley acquisition from the British Library (review to come) a great choice for the season was also my first mystery by Mavis Doriel Hay. I finished the month reading The King of a Rainy Country by Brigid Brophy – another new to me author- at the time of writing I am coming close to the end of the book, and very much enjoying it. Brigid Brophy may well turn out to be a writer for me to get excited about. My three stand out reads for the month; Lolly willowes, Vain Shadow and They Came Like Swallows. As ever I have more books that I want to read in December than I can fit in – but I do have a few that I am intending to read. Near the top of my list has to be that last Forsyte book Over the River which I am looking forward to and I have been itching to read the lovely Richmal Crompton books that Bello sent me. 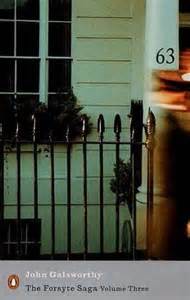 One of my book groups has chosen The lives of Others by Neel Mukerjee as a longer read to see us over December and January. My other book group will be reading Nora Webster by Colm Toibin – in fact I think I need to read that next. Rachel Joyce’s A Snow Garden a collection of Christmas themed linked stories seem absolutely perfect for this time of year. I still have several review copies waiting to be read as well, I can only do my best. What will you be reading this December? Have you any Christmassy themed books lined up? Back to reviews in a few days – but it seems as if I have run out of days. I’m posting this round up post early to make way for my books of the year post tomorrow. The last two books of 2014 will be reviewed in the first week of 2015, which seems rather untidy, but there it is. 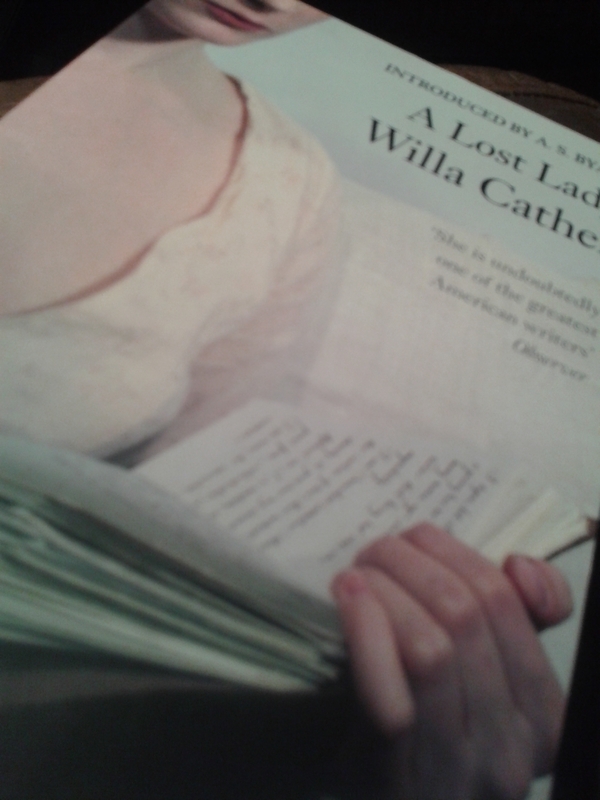 With Willa Cather reading week and Christmas holidays it has been a good reading month for me. December was a month which saw me finish Anthony Powell’s Dance to the Music of time, which has kept me company each month throughout the year. The final book on the list in fact I have only this morning started to read, however it is a slight book and I will definitely have finished it by midnight tomorrow. My December list: bringing the total of books for 2014 to 131 – a bit below the last few years I think. My stand out reads for this month; (I could easily list about seven of them, but I’ll narrow it to three). 1. A Lost Lady – Willa Cather – a beautiful novel, probably Cather’s best, it tells of the decline of a beautiful woman seen through the eyes of a young boy, later young man. 2. 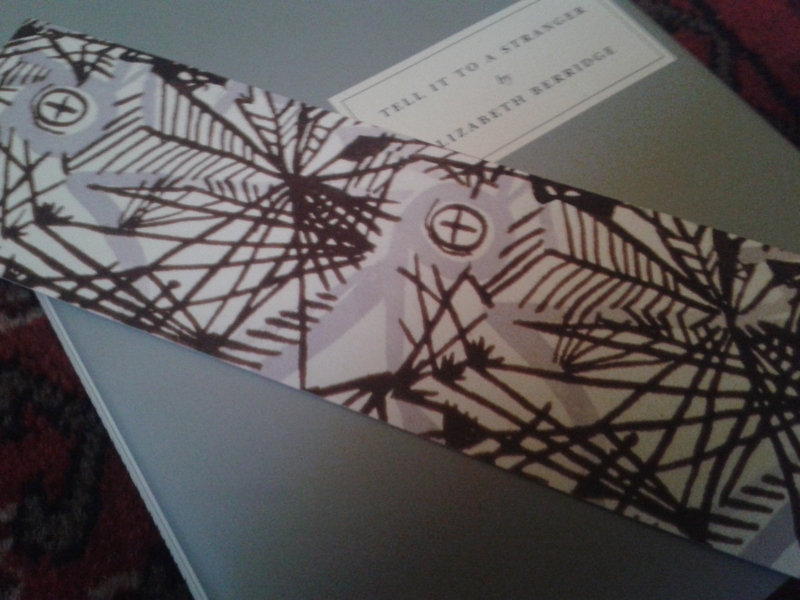 Tell it to a Stranger – Elizabeth Berridge – short stories by an author I’ve not read before, every sentence seems gloriously written. 3. 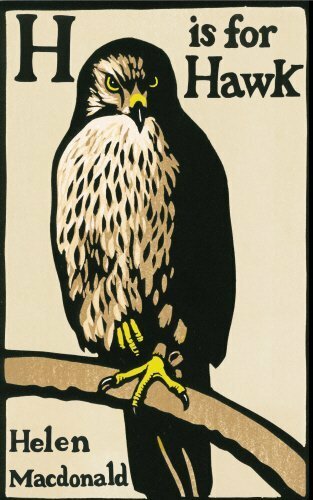 H is for Hawk – Helen Macdonald, a fantastic non-fiction book a blend of nature writing and biography, one of the best books of the year – and one which kept me sitting up very late to finish, then perversely I wanted there to be more. Review sometime in the next few days, time permitting. So then 2015 – it will be here before we know it. 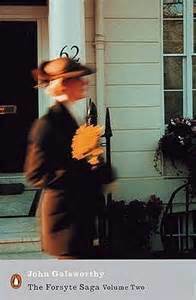 During 2015 Karen, Liz and I – and possibly one or two others will be reading the entire Forsyte Saga – there are three large volumes, each split into three main books, though some of the individual books have an interlude tagged on to the end. I read the first volume, many years ago – but never got around to getting hold of and reading the next two volumes. Well now I have a matching set, and I am looking forward to getting stuck in. A quick flick through the first volume today makes it look quite dense – fairly small print and each of the individual books over three hundred pages. Still I have a feeling I will love them, and having company along the way is always fun. At the moment I am not making too many reading plans, I want to read more poetry as I talked about recently, and there is the possibility of another Librarything group read – but nothing finalised yet. In the meantime, if you saw the picture I posted of my tbr a few days ago – you’ll know I have plenty to keep me busy. So what were your highs of December? And what are your plans for next year? I always do a little round up at the end of the month – and I do think that December should be no exception. So my review of the year post will be up on New Year’s Eve and I am posting my round up post a day early. December has been a month of mainly short books – except for my final read The Goldfinch – that wasn’t deliberate just the way my reading worked out this month. I have also read quite a few books with Christmas or wintery themes – this was deliberate and I enjoyed my seasonal reads very much indeed. At the time of writing I am still reading The Goldfinch – 300 pages to go I am fairly confident of finishing before the end of the year. Review to come naturally – but so far – good – the beginning particularly is excellent – but not the absolute wow I was anticipating. My stand out books of the month were: Dimanche and other stories – which I think may make my list of top reads for the year (still compiling it) Civil to Strangers – vintage Pym and a complete delight and Christmas at High Rising – which was utterly joyful and makes me want to read much much more Thirkell. Christmas added a lot of books to my TBR – and I am going to have to be much stricter about buying books – no really! So January 2014 is nearly upon us – and my two reading challenges will begin. 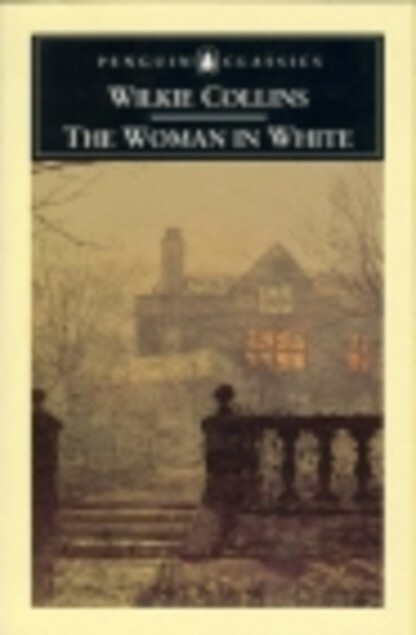 I am hoping to re-read The Woman in White by Wilkie Collins for #WilkieinWinter. January last year was a month of re-reading – I only read books I had read before and was longing to read again. I have found re-reading to be such a joy – but with the TBR in the state it is in – I will have to do a bit less re-reading this coming year – and so January will probably be the month of only one re-read. Although I may start my re-read of Jude the Obscure in January for my Hardy reading challenge – though I could leave it untill February. I also have a couple of lovely looking books which were sent to me for review which I am intending to read in January.